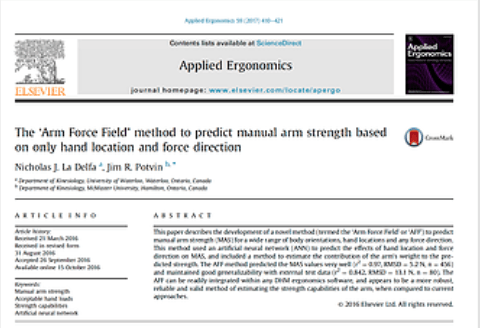 The Arm Force Field Method Paper will be Published in Applied Ergonomics in March 2017 | SantosHuman, Inc.
Congratulations to Dr. Nick La Delfa and Dr. Jim Potvin (Prof. Emer., McMasters University), whose Arm Force Field method paper will be published in Applied Ergonomics in March 2017 but is now available online. The ‘Arm Force Field’ method, accessible through Santos® Pro and Lite via the AFF Plug-in, is the most accurate and most extensively validated method of predicting manual arm force available today.